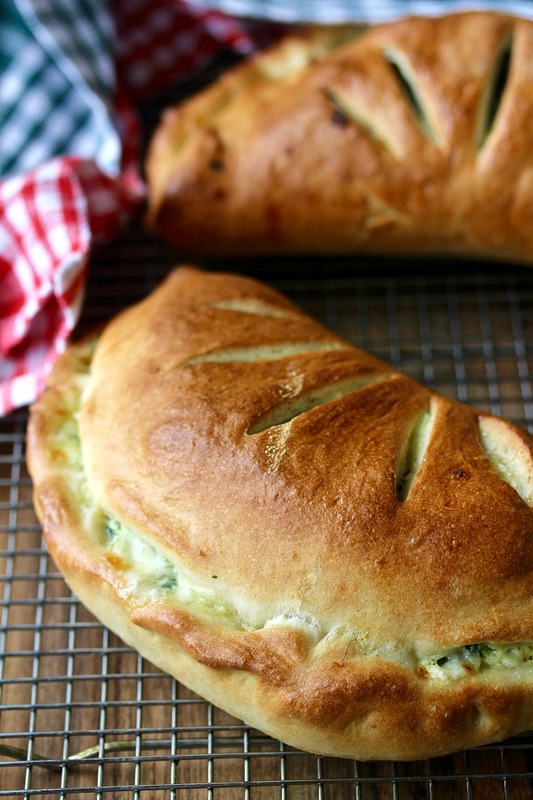 These Spinach, Ricotta, and Three-Meat Calzones are so cheesy and delicious. 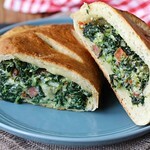 They are also loaded with spinach, and just enough Italian delicatessen meats to give them a rich and savory flavor. A calzone is an Italian stuffed bread, essentially a portable pizza! It can be shaped like an empanada or turnover, as pictured above, or rolled up like a jelly roll. It can be thin or fat, and you can fill a calzone with any kind of cheese, meat, vegetable, and sauce. I filled these calzones with a mixture of spinach, three cheeses, as well as prosciutto, pepperoni, and salami. The dough for these calzones is pretty easy to knead for just a few minutes in a food processor. The dough is not as hydrated as pizza dough, which helps it hold up to the fillings and not get soggy. As many times as I've made pizza, I can't believe I've never made calzone. Making this was so much fun, and pretty easy. Tasting it was even better. I can't wait to try more flavor combinations. In researching calzone before baking it, I saw suggestions for brushing the top of the dough with a thin coating of marinara, and then topping it with the mozzarella instead of adding the mozzarella to the filling. Doesn't that sound amazing? I need to try this next. 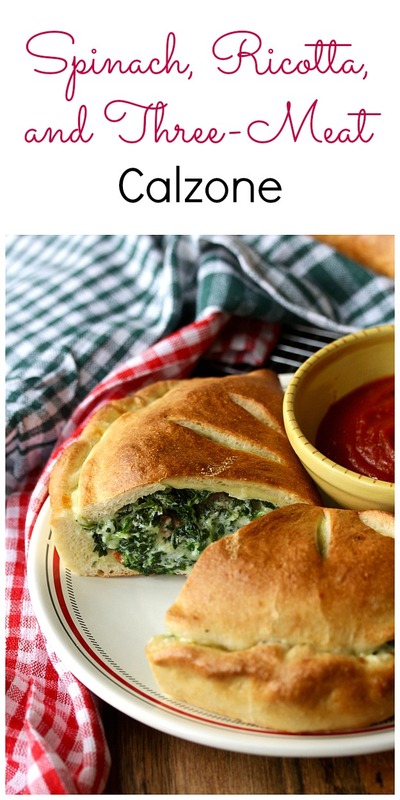 These calzones are fat with filling, and are surrounded by a chewy and crispy crust that does not get soggy. Be sure to squeeze out all of the water from the frozen spinach in this recipe (or as much as you can), and be sure to include the egg in the filling because it helps thicken it. 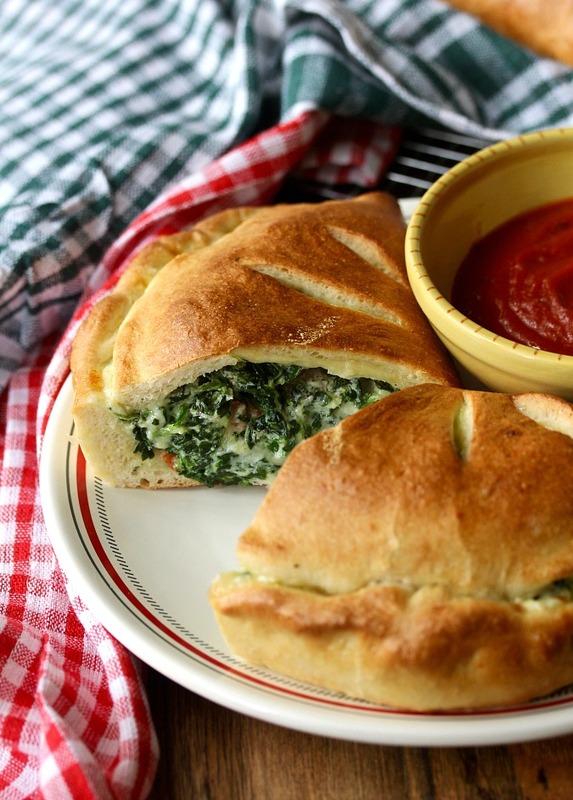 You can serve this calzone as is, or dip it in your favorite marinara sauce, as we did. So good. This month, the #BakingBloggers, all members of a group created by Sue of Palatable Pastime, are making calzones. Everyone has come up with amazing recipes. Be sure to check them out after the recipe. In the bowl of a food processor, mix the flour, yeast, and salt. Turn on the processor, and add the olive oil, then the ice water. Continue processing until the dough clumps into a rough ball, about a minute. Let the dough rest for about 2 minutes, and then process the dough for another 30 seconds. Form the dough into a ball and place it into an oiled bowl or container, cover, and let rise until doubled, about 2 hours. Mix the spinach, ricotta, mozzarella, Parmesan, oil, egg, oregano, salt, and pepper flakes. Microwave the prosciutto between layers of paper towels for 2 minutes. Microwave the pepperoni and salami between layers of paper towels for 30 seconds. Once the meats have cooled, stir them into the filling mixture. Place an oven rack on the lower position of the oven, and preheat the oven to 500 degrees F. If you have a baking stone, place it on the rack while preheating. Cut two 10 inch square pieces of parchment paper. Divide the dough in half, and stretch and roll each into 9 inch rounds on top of each piece of parchment paper. Divide the filling in half, and spread each over half of each dough round. Leave a one half-inch border. Brush the edges of the dough with the egg wash and fold the other half of the dough over the filling, leaving 1/2 inch of the bottom dough edge uncovered. Fold the bottom edge of the dough over the top, and press together to seal. Brush the calzones with the rest of the egg wash. Transfer the calzones, along with the parchment paper, to a baking sheet. Using a very sharp knife, cut 5 slits into the top of the calzones for steam vents. Bake the calzones for 15 to 20 minutes, until golden brown. Transfer the baked calzones to a wire rack to cool for 10 minutes before serving (discard the parchment). Slice and serve with your favorite marinara sauce. This recipe was inspired by a combination of a recipe from Bread Illustrated, and King Arthur Flour. OH my....these turned out amazing looking! Most beautiful calzone I've ever seen. These look amazing, Karen.So funny that it was my first time making calzoni, too. Pizza all the time, but never calzoni. Can't wait to try your version. Thanks so much Camilla. What were we waiting for? 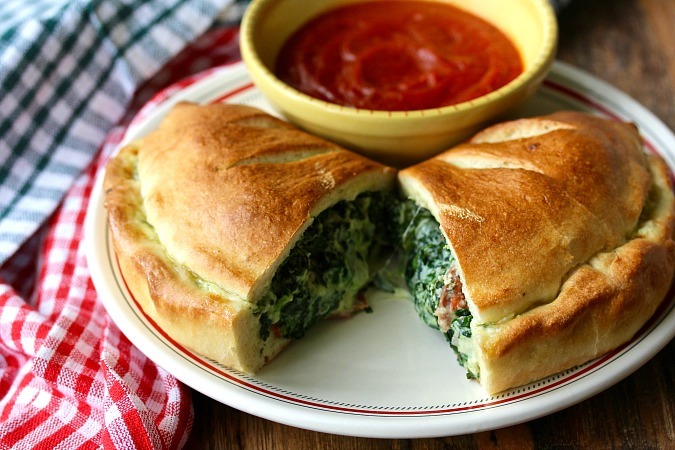 Beautiful calzones, the spinach filling looks awesome. Thanks Sneha! It's pretty darn delicious. Absolute perfection! That last photo before the recipe... wow! worthy of the cover of a magazine! Aww. You just made my day!